Share the post "Calcified Uterine Fibroids"
A calcified uterine fibroid develops when a normal uterine fibroid shrinks and becomes hardened. Learn more about calcified fibroids, the symptoms associated with these types of fibroids and the treatment options available. A uterine fibroid is a common benign tumor that often grows in the uterus of a woman during her childbearing years. These tumors are composed of muscle cells, and they are typically dense and compact. When a fibroid tumor develops, it may grow in a cluster with other tumors or as a large single mass. In many cases, women develop multiple fibroid tumors at the same time. At this time, the etiology of fibroid tumors is unclear, but there are several theories that have been speculated including a genetic predisposition for fibroid development and the effect of different estrogen/progesterone levels. Fibroids may cause a number of different symptoms, including pain, weight gain, heavier periods and more. A fibroid tumor typically becomes calcified after it outgrows its own blood supply. This forces the fibroid tumor to degenerate and decrease in size. As it degenerates, calcium deposition begins. Over time, the tumor can become completely calcified. In most cases, calcification occurs during menopause as a result of changes to the woman’s normal hormonal makeup, including the decrease in estrogen levels. As with an ordinary fibroid tumor, a calcified tumor’s symptoms can vary based on its size and position. However, once a uterine fibroid becomes calcified, it stops growing. Thus, many women with calcified fibroids notice a reduction in the severity of the pain associated with the tumor. Nonetheless, pressure on the area of the calcified fibroid may still lead to constant waist pain, which is usually made worse during menstruation. The symptoms associated with the calcified fibroid may decrease even more after menopause. 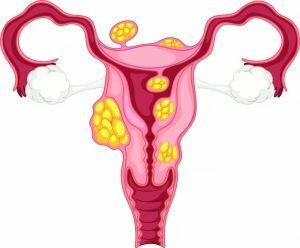 How do I know if I have a calcified fibroid? Calcified fibroids are usually diagnosed with a non-invasive ultrasound, MRI or CT scan. These are the same technologies used to diagnose normal fibroid tumors. Calcified uterine fibroids have a distinctive appearance on these reports, making it easy for the radiologist to recognize them and distinguish them from other tumors. In some cases, fibroid tumors that are only partly calcified may be discovered. Although they may look very different from other types of fibroids, treatment options for calcified fibroids aren’t much different than the options available for normal fibroids. Because the calcified fibroid is formed during the end stage of the degenerative process, however, it may not be necessary to treat the fibroid, especially if the symptoms associated with fibroid are diminishing. On the other hand, if the fibroid continues to cause symptoms for the patient, treatment options may be available to alleviate pain and other issues. If you are interested in seeking fibroid treatment for one or more calcified fibroid tumors, you need to talk to an experienced doctor to find out whether you would benefit from treatment. Please contact us today at (800) 645-6095 for a free consultation.